In 2011 we arrived two days after the tsunami waves had washed over Midway Atoll’s three islands, a place I had previously called home for 4 years. The impact of the waves was immediately apparent. This, even though all the 75 people on the island at the time of the tsunami, worked tirelessly from the moment they could, to unearth seabirds from the detritus that had been washed around. Midway’s three islands, 1500 acres in total, are home every year to over 400,000 nesting pairs of albatross. March is prime chick rearing season, with hatched chicks being anywhere from 4 to 8 weeks old. The effects of the seawater inundation were dramatic and in many cases fatal to young and old alike. It was evident that the young albatross of 2011 had been greatly impacted. However, having seen just how resilient these isolated wildlife populations can be, I knew that as hard as it might be to imagine in the moment, the following year would see a return to the “normal” cycle of life. In 2012 I was excited to return to Midway to see just that. But, I was also excited because I was returning with a special “Message in a Bottle.” Earlier in the year our marine conservation non-profit, Oceanic Society, was contacted by the project to transport one of their ceramic bottles to the center of the North Pacific gyre, or as close as you can get, Midway Atoll. The Pacific gyres are symbolic because all of the plastic waste that ends up in the ocean from the countries bordering the North Pacific ultimately ends up circulating in the gyres for decades. The devastation that the tsunami brought to Japan meant that much of the resulting debris, having been washed into the ocean would be circulating around the Hawaiian Islands for years to come. This has an additional impact in that adult albatross mistake plastic in the gyres, where they feed, for food and will return to Midway and feed that ingested plastic to their young. Often, this has a fatal outcome. 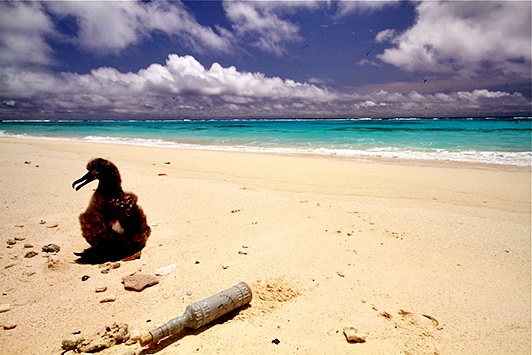 Similar to the people of Japan, for whom the symbolic bottles and messages were created, the albatross at Midway will also feel the impacts of the March 11, 2011 tsunami for generations. 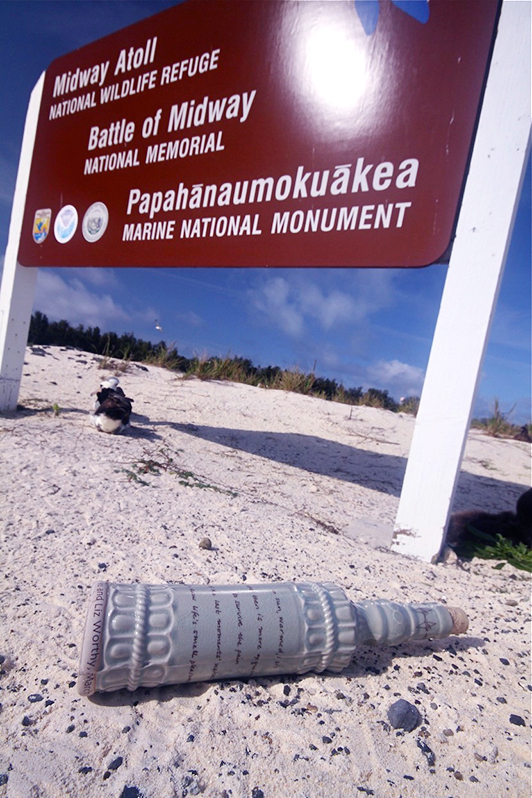 While visiting Midway I was able to place the bottle I carried there for Heather and Liz in locations around the island that helped to showcase its symbolic presence in the middle of the North Pacific gyre. I was honored that I could play a small role in a wonderful art project designed to benefit the Japanese Society for Traumatic Stress. And one that served to reinforce the connection that our two nations share even though separated by miles of ocean. Additionally, by having the bottles on Midway we were able to show that the bottles also represent the connection of man to nature, in all her fury and in all her majesty. Your first message in a bottle was launched today at 0700 local time, May 17th, in position Lat 35-39N Long 131-50E at the entrance to the Sea of Japan.May it find a home. The second bottle has been launched at 1100 local time, May 18th, position 41-37N 142-37E. Just south of Erimo Saki, where the Tsugaru Straits enter into the Pacific. There is a strong west to east current in this area, so the bottle will be headed to the US West Coast. Should land in about two years.